When you are evaluating an email archiving service, there are some key features to look for. Not all services for archiving emails are the same, with some having better mechanisms than others to prevent email data loss, ensure compliance, and enhance productivity. 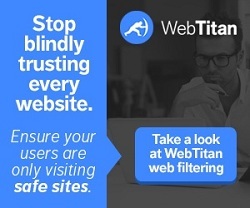 Speak with WebTitan for more information. Email data loss is a massive problem for a number businesses. In addition to the threats from phishing, malware, and ransomware, cybercriminals have been known to hack into mail servers, remove email archives, and replace them with a ransom note threatening to delete the data if the ransom is not paid. However, not all email data loss is attributable to outsiders. According to a study conducted by Osterman Research in 2016, 69% of businesses had suffered “significant data or knowledge loss” due to employees maliciously deleting emails or taking email data with them when they left their jobs. The results of the study mirrored those found by the Ponemon Institute in 2009 – implying that email data loss due to insiders is not a recent phenomenon. Email data loss is not the only issue businesses have to content with in relation to archiving. Most major industries have regulations stipulating retention periods for sensitive or personal data. There is also federal and state legislation to comply with. In some cases, sections of emails databases have to be archived indefinitely – creating problems with storage capacity and server utilization. Additionally, research suggests that many businesses retain email data to resolve potential future HR issues or future litigation. Studies have shown as much as 75% of intellectual property is maintained in email format, and therefore it is essential that whichever email archiving service is implemented is capable of fast and accurate disaster recovery – a common stipulation of regulatory compliance. As well as being fast and accurate at restoring data after a disaster, an email archiving service needs to be efficient at searching and retrieving data if your business collects, processes, or maintains data in email format containing EU citizens´ personally identifiable information. Under the General Data protection Regulation (GDPR) an EU citizen has the right to request access to their data at any time, and access requests must be resolved within thirty days. Also under GDPR, businesses must not only ensure the integrity of personal data and protect it against theft, loss, or unauthorized disclosure, but prove compliance if requested to do so by a “supervisory authority”. In terms of regulatory compliance, GDPR has the security requirements of Sarbanes-Oxley, the audit requirements of HIPAA, and the broad reach of the Federal Rules for Civil Procedure. A survey sponsored by Adobe in 2016 found that 57% of employees wasted at least one hour per day searching for misfiled or missing documents and emails. Many of the misfiled and missing emails had been deleted by mistake and employees would request IT personnel would recover them – decreasing the productivity of two employees rather than one. It is possible to eliminate the dual loss of productivity with an email archiving service that provides employees with an easy-to-use search and retrieve function. Missing emails can be found and restored, printed, or exported within minutes without the assistance of IT personnel. Naturally, it is important that proper access controls are implemented when providing this facility. The most effective type of email archiving services are cloud-based. Cloud-based email archiving services have the benefit of centralizing emails distributed across multiple servers into one location. Copies of each inbound and outbound emails are made in real time, de-duplicated, compressed, indexed, and encrypted before being transferred via a secure connection to a data center. Deduplication is a process that removes duplicated content and attachments from emails to reduce the amount of storage space required. It also accelerates the search and retrieval process, and ensures search results are not full of duplicated content. Access controls are necessary in order to mitigate the risk of email data loss and ensure regulatory compliance. The simplest way to implement access controls is to integrate the email archiving service with Active Directory or LDAP. Tamper-evident audit trails are a key capability for determining when an archived email has been accessed, by whom, and what actions were taken. The best email archiving service allows administrators to reverse alterations when they have been made without the proper authorization. ArcTitan is a user-friendly cloud-based email archiving service from WebTitan that guarantees your business will never suffer an email data loss due to malicious insiders again. Compliant with all domestic and international regulations for data retention, security and auditing, ArcTitan enables businesses to apply their own archiving policies to ensure archived emails are never deleted in error. In addition to including all the things to look for in an email archiving service, ArcTitan is proven to be secure. All data transfers to and from our IL5 certified data center are conducted via mandatory TLS, during which passwords are also hashed to eliminate the threat of “Man-in-the-Middle” attacks and other unauthorized interceptions. Being a cloud-based service, ArcTitan is compatible with every operating system and works with all email service providers. Our email archiving service can process up to 200 emails per second and search a database of 30 million emails in under a second. For larger businesses and enterprises, ArcTitan scales up to 60,000 users without any loss of performance. If your business would like to mitigate the risk of email data loss, ensure compliance with federal, state, and industry regulations, and enhance productivity, speak with us about a free trial of ArcTitan´s email archiving service. Our team of Sales Technicians will be happy to explain how the free trial works and walk you through the simple registration process. Setting up the free trial takes just a few minutes and, if necessary, we are happy to discuss the process with your IT team to ensure a seamless transition. Please note, there are no set-up costs with regards to data conversion, nor any obligation on your business to subscribe to the ArcTitan service once the free trial is concluded. However, as the trial consists of a fully-enabled version of ArcTitan, should you decide to continue archiving emails securely with our service, no configuration changes will be required.